Background: Most common lesions seen in children are mucoceles. Different techniques have been described for their treatment; however, most of them are invasive. Objective: Aim of the study was to compare the practicability of micro-marsupialization with surgical excision in treatment of mucoceles. Materials and Methods: A pilot study was done on 15 patients to evaluate and compare variables like lesion evolution, surgical time period, healing, complications etc. when lesions were treated with micro-marsupialization and surgical excision. Results: Most of the mucoceles diagnosed in this pilot study were found in lower lip. Amongst cases that were treated with micro-marsupialization, recurrence was seen only in one case, whereas there were 3 cases of recurrence seen in surgical excision group. No statistically significant difference was found between the treatment methods used. Conclusion: Micro-marsupialization can be a non-invasive option to treat mucoceles in pediatric dentistry owing to its simplicity, fewer complications involved and as well that it's well-tolerated by patients. Background: The buccal bulge of the deciduous first molars has always been a restorative challenge to the pediatric dentist. Morphologically it may vary from a slight prominence to a well-developed cusp-like structure. Aim: This study was conducted to determine the variable buccal surface morphology of deciduous first molar and its clinical relevance. Materials and Methods: A prospective study was conducted whereby 2016 patients visiting the outpatient clinic of dental hospital over 1 year were evaluated. Any variation in buccal surface morphology of the deciduous first molars was recorded photographically or by replicating in dental stone. Results: Varied morphological patterns on buccal surface were observed for which a new classification scheme has been proposed. Conclusion: The surface morphology of deciduous teeth crowns must be studied carefully as it may be indicative of pulpal extensions and accessory roots, requiring consideration during restorative treatment planning. Objectives: To evaluate and compare the attitude toward behavior techniques among parents of healthy and special children in Indian subpopulation. Materials and Methods: Parents of healthy (Group A) and special children (Group B) watched videotape vignette of 10 behavior management techniques (BMTs) in groups and rated them using Visual Analog Scale (VAS). Group B parents were subgrouped as: Group B 1 (34 parents of medically compromised children), Group B 2 (34 parents of physically compromised children), and Group B 3 (34 parents of children with neuropathological disorders). Results: Both Group A and Group B subjects judged all techniques as "acceptable." Group B parents were less accepting to techniques than Group A parents, except live modeling. Contingent escape and live modeling were the first ranked techniques in Group A and Group B parents, respectively. Voice control (VC) and hand-over-mouth exercise (HOM) were the least accepted techniques in both groups. Parents with low income and less education were more receptive to the techniques studied. A total of 25.49% of parents in each group did not consent to the use of HOM. Conclusion: Factors such as having a disabled child, low income, and less education influenced parental acceptability. HOM should be used with great caution and clinicians should approach the issue of informed consent on an individual basis. Aims : This in vitro study was conducted to evaluate and compare the micro-hardness of composite resin and resin-modified glass ionomer cement using light-emitting diode (LED) and halogen curing and also to inter-compare the effect of LED and halogen curing. Materials and Methods : The study sample comprised of 4 stainless steel plates with a thickness of 2 mm. For these stainless steel plates, holes were made to a diameter of 3 mm. The samples were divided into 4 groups of 8 each and labeled as group I, group II, group III, group IV, thus making provision for the two different modes of light exposure. In each group, the hole was restored with its respective restorative material and cured with light-curing unit according to manufacturer instructions. The results were statistically analyzed using Mann-Whitney test. Results and conclusion: It was concluded that the curing efficacy of the LED lamp was comparable to that of conventional halogen lamp, even with a 50% reduction in cure time, and resin composite (Filtek Z-250) presented the highest hardness values, whereas complete hardening of resin-modified glass ionomer cement (RMGIC) (Vitremer) was observed because of its self-curing system even after the removal of light source. Context: The extensive plaque formation on dental restorations may contribute to secondary caries or periodontal inflammation. Therefore, it is important to know how different types of dental restorations may prevent or promote the accumulation of microorganisms. Aims: The aim of this in vivo study was to evaluate the adhesion of Streptococcus mutans to preveneered and stainless steel crowns (SSCs) and to evaluate the effects of these restorations on the gingival health and oral hygiene. 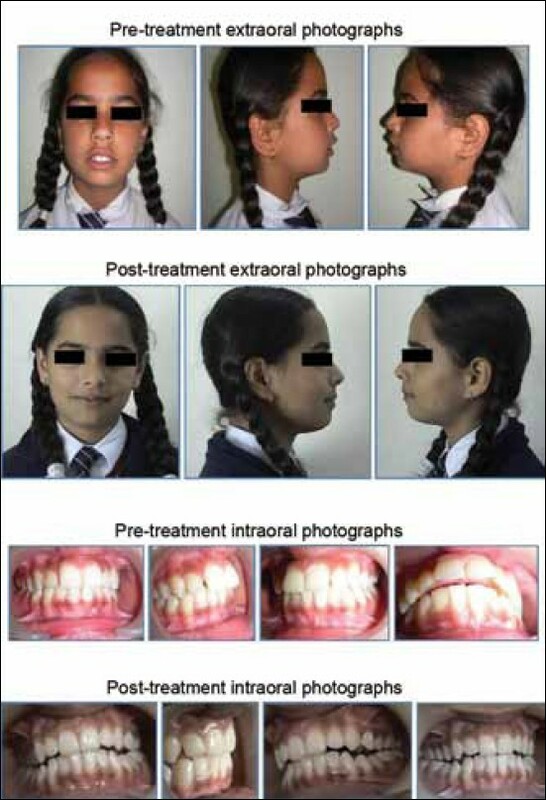 Materials and Methods: Twenty patients (age 3-5 years) were selected from the outpatient clinic of the pedodontics department, Faculty of Oral and Dental Medicine, Cairo University. The selected patients had (dmf) index for primary dentition ≤4, including lower right and left first primary molars. Each tooth was pulpotomy-treated and restored with either type of crowns (split-mouth technique). Then, ten swabs from the buccal mucosa, preveneered crown, and SSC surfaces were taken from each patient. Also, the gingival index (GI) and oral hygiene index (OHI-S) were measured at different times during the study. Mitis Salivarius Bacitracin agar (MSBA) was used as a selective medium for S. mutans growth. MSBA plates were taken in candle jar and incubated aerobically in 37°C for 48 h. Finally, bacteria were counted and expressed in colony forming unit (CFU). Results: After 1, 2, and 4 weeks, mucosa and crown swabs of preveneered crown showed statistically significant higher mean CFU counts than SSC. Through the whole study period, the two restorations revealed a statistically significant decrease in mean CFU counts. Also, there was a statistically significant positive (direct) correlation between OHI-S, GI, and S. mutans counts on both restorations. 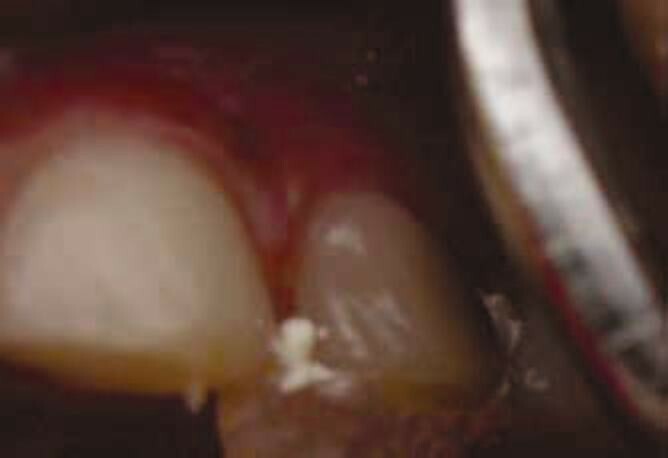 Conclusions: The adhesion of S. mutans to preveneered crowns was higher than to SSC. Full mouth rehabilitation led to significant decrease in S. mutans count in the short term. An increase in S. mutans counts is associated with an increase in OHI-S and GI. Aim: The aim of the present study was the evaluation of non-microbial salivary caries activity parameters and salivary biochemical indicators in predicting dental caries. 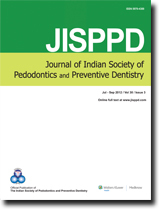 Materials and Methods: The present study was carried out on 60 children, aged 4-6 years, selected from the schools of Panchkula district, Haryana, on the basis of their caries status. Level of hydration, flow rate, pH, buffering capacity, relative viscosity, calcium, phosphorus and alkaline phosphatase levels in caries-free and caries-active children were evaluated. Results: Results showed that 90% of subjects in the caries-free group and 30% of subjects in the caries-active group had normal level of hydration value of less than 60 s and the difference was found to be statistically very highly significant. Normal flow rate of stimulated saliva was found in 90% of the subjects in caries-free group and 33.3% subjects in the caries active group and difference was found to be statistically very highly significant. Adequate salivary pH was found in 100% subjects in caries-free group and 30% in caries-active group and the difference was statistically very highly significant. Conclusion: To conclude, within limitations of this study, it became clear that normal level of hydration and higher values for flow rate, pH, buffering capacity of saliva lead to good oral health and a reduced caries occurrence. Increased salivary viscosity plays a role in increasing caries incidence. Salivary biochemical indicators like calcium, phosphorus and alkaline phosphatase also play their respective role in determining caries susceptibility of an individual. These salivary parameters can be used as diagnostic tool for caries risk assessment. 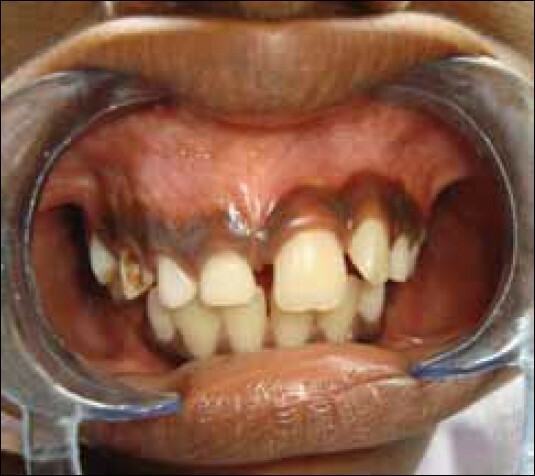 Most of Class II malocclusions are due to underdeveloped mandible with increased overjet and overbite. Lack of incisal contact results in the extrusion of the upper and lower anterior dentoalveolar complex, which helps to lock the mandible and prevent its normal growth and development, and this abnormality, is exaggerated by soft tissue imbalance. The purpose of present study was to cephalometrically evaluate skeletal and dentoalveolar changes following the use of Twin-Block appliance in 10 growing children of age group 9-13 years (mean 11.1 year ± SD 1.37) of Class II division 1 malocclusion with a deficient mandible. Cephalometric pre- and post-functional treatment measurements (angular and linear) were done and statistically analyzed using student's paired t-test. The results of the present study showed that maxilla (SNA) was restricted sagittally (head gear effect) with marked maxillary dental retraction. Significant mandible sagittal advancement (SNB) with minimum dental protraction was observed with significant increase in the mandibular length. The maxillomandibular skeletal relation (ANB and WITS appraisal) reduced considerably which improved the profile and facial esthetics. Pronounced correction of overjet and overbite was seen. The present study concluded that Class II correction occurs by both skeletal and dentoalveolar changes. Objective: To evaluate retention of two resin based fissure sealants (Embrace and Delton FS+) for a period of twelve months. Materials and Methods: Sixty eight first permanent molars were sealed for seventeen healthy children in the age group of six-eight years. According to random selection, the first permanent molars on the right side of both arches were sealed with Embrace (Group A) and on the left side of both arches were sealed with Delton FS+ (Group B). Results: The total retention of Embrace was 23.50% and for Delton FS+ was 17.60% at one year. Conclusion: At one year the total retention of Embrace was 23.50% and for Delton FS+ was 17.60%, however the results were statistically insignificant. Objectives : Dental caries is the most prevalent oral disease. Streptococcus mutans plays a major role in the occurrence of dental caries. Many antibacterial agents have been developed against dental caries. However, they lack the qualities of an ideal agent. Thus presently, antibacterial activity of herbal agents is being extensively studied. Materials and Methods: In the present study, ethanol extract of Terminalia chebula was prepared and mouthrinse was formulated. A total of 60 children meeting the inclusion criteria were randomly divided into study and control group and respective mouthrinses were administered. Salivary Streptococcus mutans count was assessed at 5 and 60 minutes after rinsing and compared with baseline values. Substantivity of the rinse was assessed among 10 children. Mouthrinse was given to the children and salivary Streptococcus mutans counts were assessed at baseline, 6 and 12 hours postrinsing. Mann-Whitney U test was used to assess the variance of factors like Decayed Missed Filled Teeth, plaque scores, and gingival scores. ANCOVA (Analysis of covariance) was used to determine the change in salivary Streptococcus mutans colony forming units taking baseline values as covariates. Results: It was observed that there was 44.42% reduction in salivary Streptococcus mutans colony forming units 5 minutes after rinsing as compared with baseline values and 64.14% reduction in Streptococcus mutans colony forming units at 60 minutes after rinsing as compared with baseline values. There was a reduction of 35.48% in salivary Streptococcus mutans colony forming units at 60 minutes after rinsing as compared with 5 minutes sample. Conclusion: Streptococcus mutans counts were low up to 6 hours postrinsing among 80% of the children. Objective: The severity of cleft lip (CL) varies considerably from complete bilateral CL and palate at one end of the spectrum to a minimal CL at the other. In some cases of microform clefting, there may be no visible manifestation of the defect on the lip surface (i.e., the defect is occult) and no residual functional deficit. 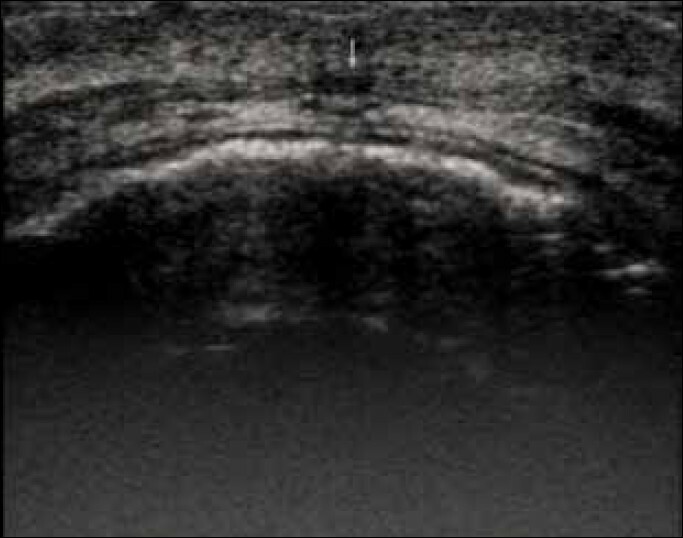 This study used high resolution ultrasonography to detect subclinical anomalies of orbicularis oris muscle (OOM) in first degree relatives of CL +- cleft palate children and compared it with controls. Materials and Methods: Thirty relatives of 25 children with non-syndromic CL or CL+ CP were identified for the study. Thirty subjects having negative family history of CL/P in three generations and absence of any minimal cleft features were taken as controls. Ultrasound scans of OOM of all the controls and relatives were taken. Statistical analysis was performed using standard χ2 tests with Yates correction. Results: Defects were seen in 13.3% of relatives and no defects were seen in controls, this was not statistically significant. Conclusion: The data support the hypothesis that subclinical CL cases with subepithelial OOM defects do exist and Orbicularis oris discontinuities represent the mildest form of CL. Background: Hereditary, environmental and developmental factors play an important role in dentofacial development, as well as the initiation of malocclusion disorder. Allergic phenomenon such as asthma that induces an alternative mode of breathing in patients is a contributing factor in development of the dental arch. Aim: Our aim in this study was to evaluate the dentoalveolar morphology in asthmatic children and to analyze the effects of asthmatic medications on the dental arch. Setting and Design : This study is centered on 44 asthmatic children aged between 6-12 years from J.S.S Hospital, Mysore. Selected variables from model analysis of the casts of the asthmatic group were subjected to comparison with those of the non-asthmatic group, which comprised of 44 non-asthmatic children. 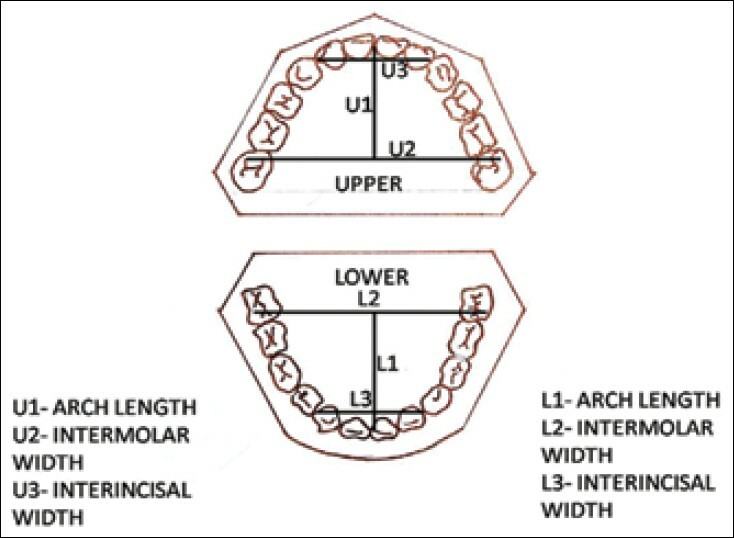 Selected parameters were arch width, arch length and palatal depth. Materials and Methods : Impressions of upper and lower arches were made with rubber based impression material. A sliding digital caliper was used to measure the casts for arch width and arch length. A palatal depth gauge was used to measure the palatal depth. Statistical Analysis : Differences in arch widths, arch lengths and palatal depths between asthmatics and non-asthmatics groups were evaluated by independent sample t-tests. Chi-square test was applied to assess the frequency of occurrence of malocclusion in the asthmatic children. Result: The results obtained revealed that the arch length and palatal depth of asthmatic group had higher values compared to that of non-asthmatic groups for both age groups (6 to 8-year-old males and females, 10 to 12-year-old males and females). Inter molar width showed a significant lower value in asthmatics in the maxillary arches of 10 to 12-year-old females. Fifty percent of the asthmatic children aged 10 to 12-years had open-bite. Children under regular medication showed significant deviation in the dentoalveolar morphology as compared to those under irregular medication. Conclusion: The present study proves a strong relation between asthma and dentoalveolar morphology. Multiple epiphyseal dysplasia with early-onset diabetes mellitus (also known as Wolcott-Rallison syndrome) is a rare autosomal recessive disorder that manifests itself in early infancy with symptoms of diabetes mellitus. Short stature and walking difficulties become evident in the 2 nd year of life when the child starts to walk. These skeletal changes are progressive with age. There is usually a short trunk, excessive lordosis, a short and broad chest, and genu valgum. 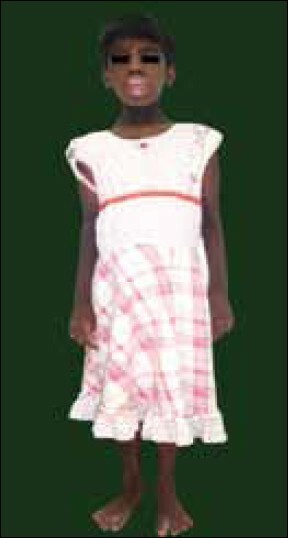 This report presents a case of Wolcott-Rallison syndrome in a 10 year old child. Treacher Collins syndrome (TCS) is an autosomal dominant disorder of craniofacial development characterized by variable involvement of the craniofacial structures derived from the first and second branchial arches. Occurrence of this syndrome is relatively rare with wide variations in the clinical expression. Aspects of speech, appearance, and social well-being along with psychological issues are hampered in these patients. Treating such disabled children poses a great challenge not only in the medical field but also in the dental meadow. We report a case of a 5-year-old boy who presented with this syndrome and the dental treatment was carried out with a noteworthy outcome for a period of 8 years. A brief review of etiology, dental anomalies along with prognosis is documented. Seckel syndrome, first defined by Seckel in 1960, is a rare (incidence 1:10,000), genetically heterogeneous autosomal recessive disorder presenting at birth. This syndrome is characterized by a proportionate dwarfism of prenatal onset, a severe microcephaly with a "bird-headed" like appearance (beaked nose, receding forehead, prominent eyes, and micrognathia), and mental retardation. The significance of dental alterations in this syndrome resides in the defect, hypoplastic enamel, being limited to the primary dentition; in most instances the second primary molar tooth is not affected. A case of the Seckel syndrome is presented. Orofacial granulomatosis comprises a group of diseases characterized by noncaseating granulomatous inflammation affecting the soft tissues of the oral and maxillofacial region. 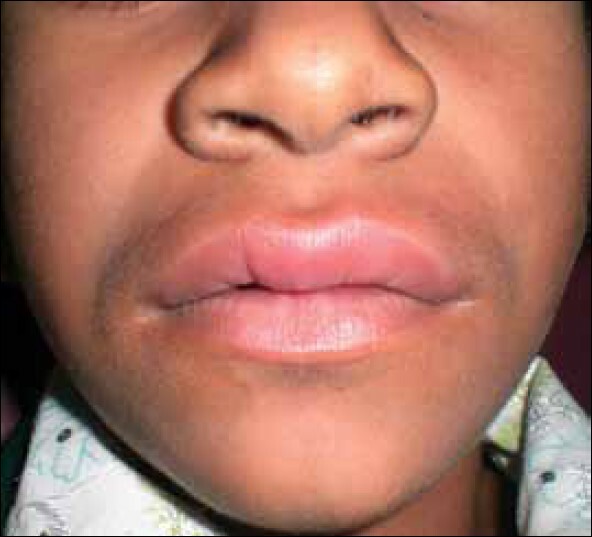 The most common clinical presentation is persistent swelling of one or both lips. It is important to establish the diagnosis accurately because this condition is sometimes a manifestation of Crohn's disease or sarcoidosis. 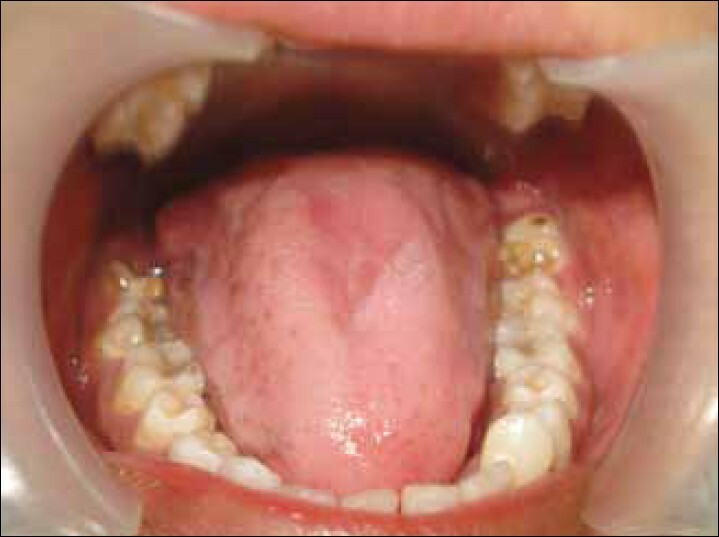 This article describes a case of orofacial granulomatosis. The case presented here is of a 15-year-old girl in whom nearly all the teeth except for lower first molars and lower central incisors showed short roots as observed through panoramic radiograph. At the same time there was difference in the length of roots of various teeth. The patient suffered an acute attack of Stevens-Johnson syndrome (SJS) at the age of 8 years and since no other possible explanation for the short roots anomaly could be found, it could be concluded that the cessation in root development may have been caused by the destruction or damage of the epithelial root sheath during the SJS disease. 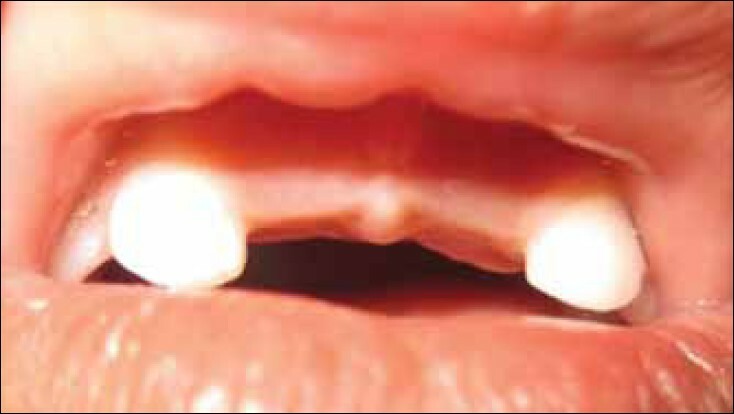 Impaction of primary anterior teeth is very rare. A tooth that fails to erupt into normal functional position by the time it normally should is considered impacted. 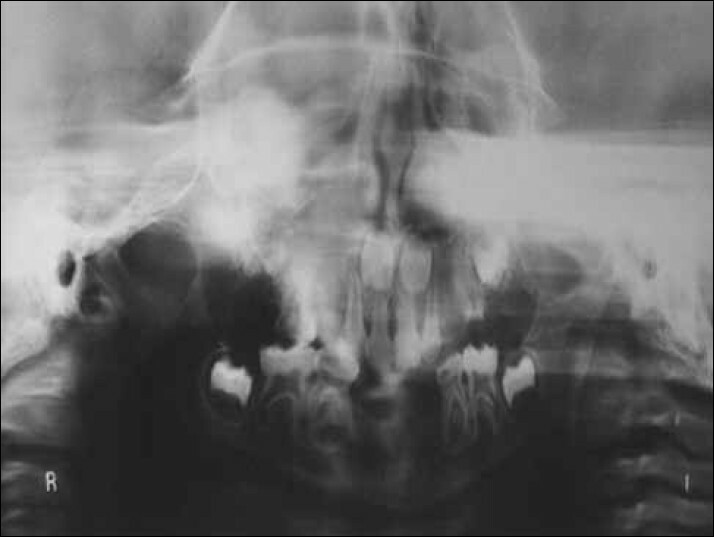 A rare case of impacted dilacerated maxillary primary incisors in a 3-year-old child is presented. The diagnostic position of impacted primary incisors was determined using conical beam computed tomography (CBCT) to assist in surgical intervention with least surgical trauma to the tissues. Odontomas are considered to be the most common odontogenic tumors of the oral cavity. Some authors consider it as malformations rather than true neoplasms. The exact etiology of odontomes is still not known. Most odontomes are asymptomatic and are discovered during routine radiographic investigations. Odontomes generally cause disturbances in the eruption of the teeth, most commonly delayed eruption or deflection. 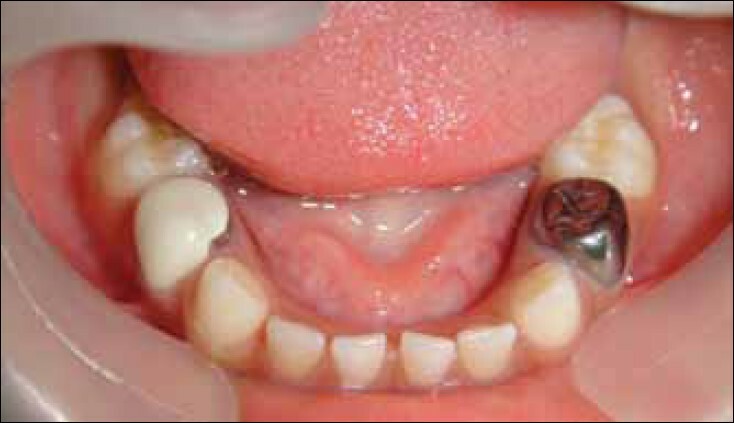 The present report describes the surgical management of a case of compound odontoma in a 10-year-old boy who presented with a complaint of swelling in the maxillary right anterior region and retained deciduous incisors. The related literature is also being reviewed in this article. Rabson-Mendenhall syndrome is a rare, autosomal recessive disorder affecting insulin receptor. This disorder is characterized by insulin-resistant diabetes mellitus, hyperinsulinemia, deficiency of subcutaneous fat, acanthosis nigrican, growth retardation, coarse and senile appearance, precocious puberty, and dental prematurity, enlarged genitalia, and pineal hyperplasia. Mutations of the insulin receptor gene affecting insulin action appear to be the basic mechanism underlying this syndrome. Herein, we present a case report on Rabson-Mendenhall syndrome in a 9-year-old girl.